The Anti-tobacco movement was based on the hugely successful model of temperance reform. 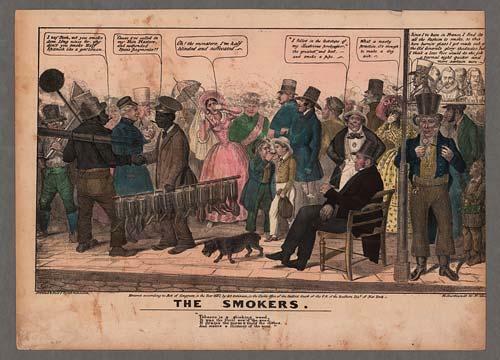 This cartoon of a room full of smokers was created in 1837 by artist Edward Williams Clay (1799-1857) and published by Henry R. Robinson (d. 1850). In the upper right there are busts representing famous personages from history who smoked: Sir Walter Raleigh, Sir Isaac Newton, and others. A man at far right, dressed in a striped vest and tall hat, says, "Since I've been in France, I find its all the fashion to smoke, so this here burnin' glass I got made out of the Old Gineral's glory spectacles, but I think a loco foco would do the job a tarnal sight quicker and more sartain sure." Old Gineral refers to outgoing President Andrew Jackson, and the Loco Foco refers to the New York Democratic Party. An African-American woman on the right holds her hand over her nose and says, "What a nasty practice, it's enough to make a dog sick." In the foreground, we see a small dog that does indeed look sick. The heavyset man sitting on the bench says, "I follow in the footsteps of my illustrious predecessor, the greatest and best, and smoke a pipe." He represents the current President Martin Van Buren, smoking a pipe like President Jackson, the man who had hand-picked him to be his successor. In the center there are two young boys with cigars, illustrating the hold of tobacco on young people. A white woman at the center also holds her hand over her nose and complains, "Oh! the monsters, I'm half blinded and suffocated!" This shows the gender associations, with tobacco falling under the men's sphere, and something outside the sphere of the woman. The African American man facing right says, "I say Josh, wot you smoke dem long nines for, why don't you smoke Half Spanish like a gen'leman." showing even lower class menial laborers such as this apparent chimney sweep know the difference between brands of cigars and their reputations. Josh answers him with, "Cause I've called in my Shin Plasters, and suspended Specie Payments!!" which refer to the financial practices which led to the Panic of 1837. Shin Plasters refers to privately issued paper money, given out by merchants, and only redeemable at those merchant's storehouses. Specie Payments refers to President Jackson's Specie clause, which allowed debtors to demand repayment of debts in specie, that is, gold or silver, rather than the inflated paper money. Black man facing right: I say Josh, wot you smoke dem long nines for, why don't you smoke Half Spanish like a gen'leman. Josh: ‘Cause I've called in my Shin Plasters, and suspended Specie Payments!! And makes a chimney of the nose."